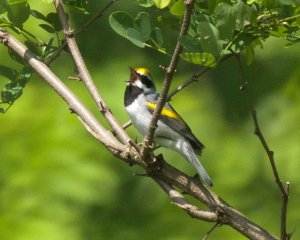 It seems like the golden-winged warbler (GWWA) has become the non-game poster bird for everything from clearcuts to shelterwood cuts to overstory removal to seed tree harvests in our national forests. The philosophy appears to be “if you build it they will come,” see —www.srs.fs.usda.gov/compass/2014/07/03/young-forests-can-benefit-wildlife/. As an avid birder and one who contracted with the USDA Forest Service for nine years doing bird point surveys across Western North Carolina on the Tusquitee, Cheoah, Pisgah, Appalachian/Toecane, French Broad and Grandfather Districts of the Nantahala and Pisgah national forests, I can assure you that no one would be happier than I to see an uptick in this beautiful little bird’s population. But it ain’t as simple as just sawing trees down. There are a lot of competent scientists out there working on ways to help this neotropical migrant, especially in light of the U.S. Fish and Wildlife Service’s 2011 announcement that the GWWA had been petitioned for listing as an endangered species. The Golden-winged Warbler Working Group partners in our area include the Ruffed Grouse Society, The Audubon Society, Georgia Department of Natural Resources, University of Tennessee, U.S. Forest Service, Audubon North Carolina, Partners in Flight and many more. Not all cogs turn in the same direction all the time, but much information is being gathered and best management plans are being drafted. Just another extreme Audubon tree-hugger, right? Well the next paragraph states: “Using this information it becomes clear that success is unlikely in-east-draining forests below 2,500 feet. Much of the Pisgah in the Harpers Creek, Lost Cove, Wilson Creek areas would be unsuitable using that criteria. Conversely, some areas of the Nantahala may be very suitable including such areas as Miser’s Creek, Cheoah Mountains or Wayah Bald. These areas have stable populations for colonization, and elevation and aspect parameters that meet the needs of the species. This type of information is necessary for all of the species of conservation concern, and unfortunately is very lacking for most.” All Smalling was imploring was, use the best available science. So, if my math is right, let’s see … carry the one, yep that would be since 1970. If the clearcutting of our national forests in the 70s and 80s did nothing to enhance GWWA populations, I don’t believe the “build it and they will come” philosophy will pay off now.